This morning when I woke up I didn’t feel like working out. I wasn’t feeling so hot last night so I decided to lounge this morning and will do my workout this afternoon. 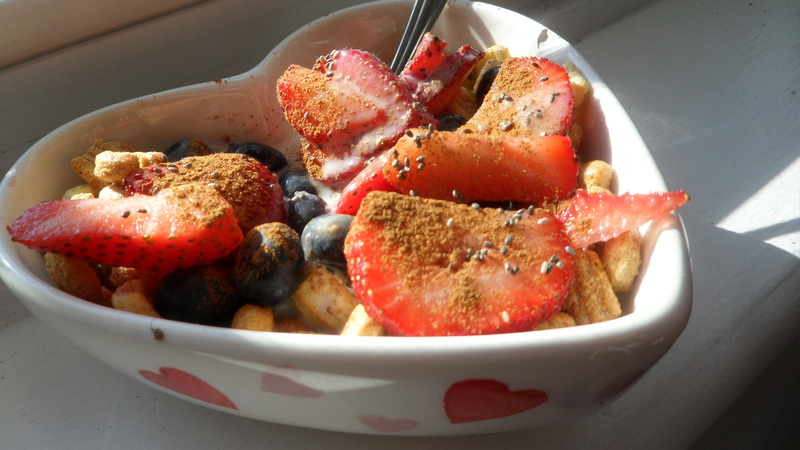 Cereal Combo – Kashi heart to heart, Fiber one 80 calorie, blueberries, strawberries, lots of cinnamon, chia seeds and almond milk. 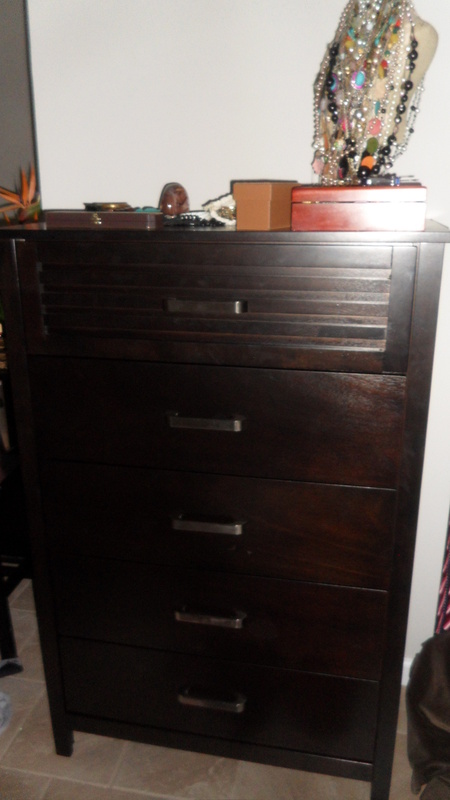 After reading some of my favorite blogs I turned on Regis and Kelly and unpacked the last of my boxes to fill the dresser drawers. It feels good to have all of the boxes out of the house! While I was unpacking I realized that I have A LOT of shoes, A LOT of clothes and A LOT of jewelry. I always thought my shoe collection was impressive until I read this article a couple of weeks ago. Suri Cruise’s shoe collection is worth $150,000. Way to get shown up by a 5-year-old, Alyssa. I’m going to finish putting away my pathetic shoe collection and go for a long bike ride. 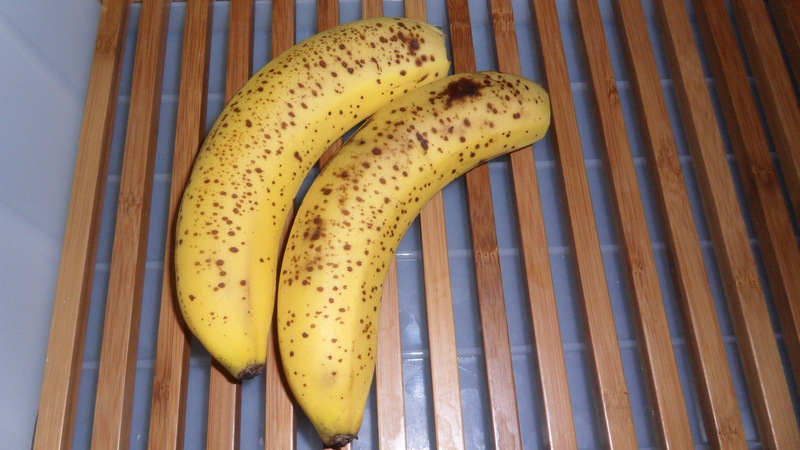 I have 2 bananas that want to be baked into something yummy later – Any ideas?? QUESTIONS: What do you have a lot of? Clothes, Shoes or Accessories? What should these bananas be baked into!? Ahh, yes…back to those cookies I whipped up after traumatizing myself on Sunday. 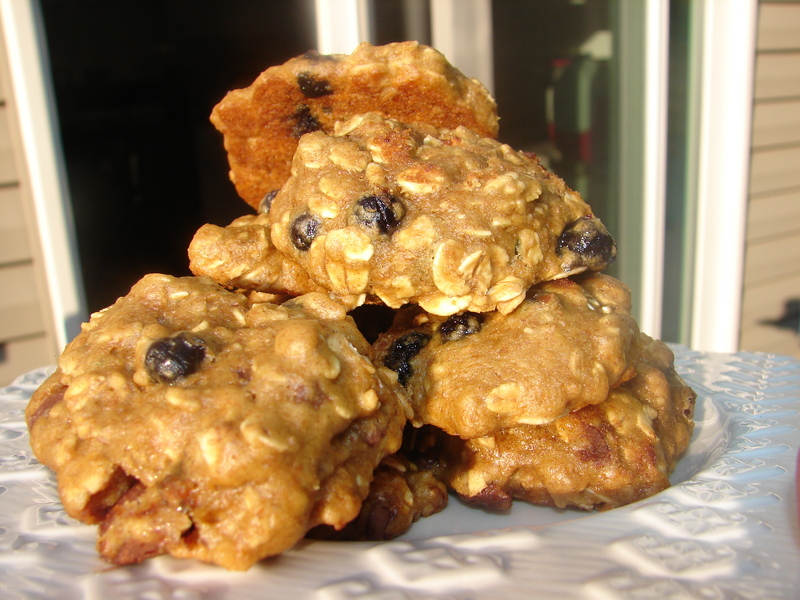 Mini Vegan Oatmeal Blueberry and Carob Chip Cookies. We’re gonna have to think of a shorter name than that because I could’ve eaten two cookies by the time I was done telling you their name. These cookies are healthy and miniature size…so it’s OK if you eat more than one. If you’re really stressed like me you could eat 4. And cookie dough, of course 🙂 Life’s too short to not lick the spoon! Beat the first three ingredients, then add the flour, baking soda, and salt and beat again. Stir in the oats, then add the egg replacer. Add dried blueberries and carob chips. Mix well. Scoop with a rounded tablespoon and add each cookie to greased baking sheet 2 inches apart. Since there is no added sugar, no oil and there is oatmeal and fruit I totally think this is breakfast acceptable. Am I right, or am I right? 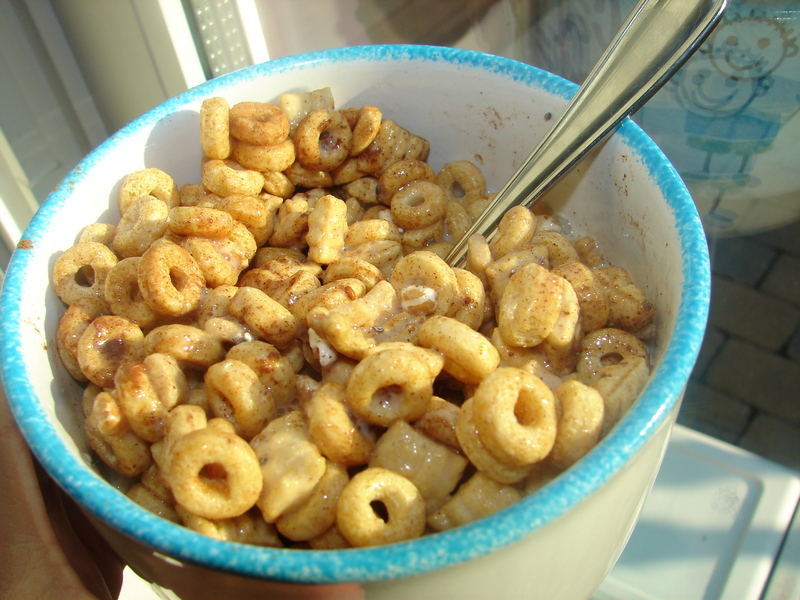 In this bowl: Cinnamon Cheerios, Kashi Honey Sunshine, Kashi Go Lean w/ more cinnamon & chia seeds with Unsweetened Original Almond Milk. De.Freaking.Licious. Last night I came home to a surprise. My entire family was over for an impromptu BBQ. 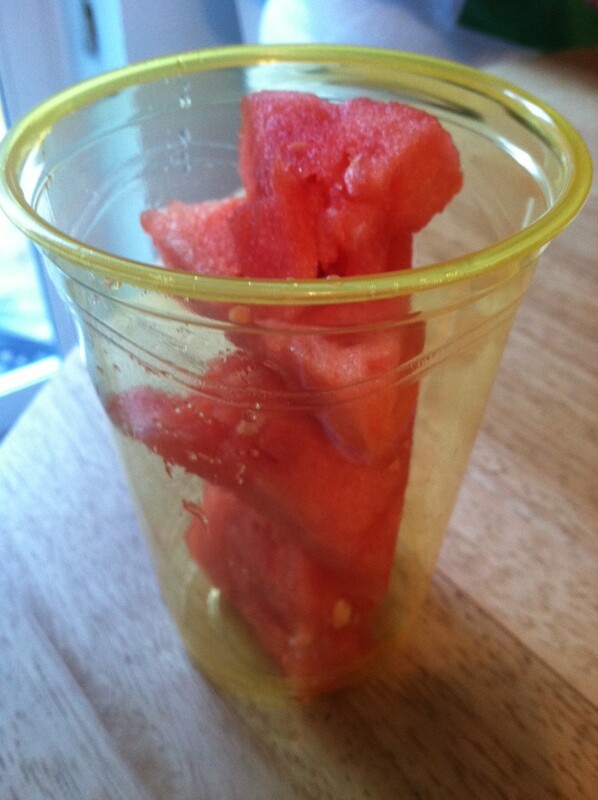 This is why I love summertime. 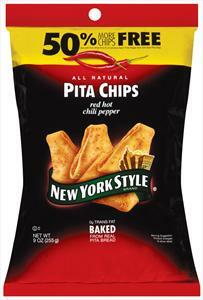 I ate my weight in pita chips before dinner… We had Red Hot Chili Pepper flavored by New York Style. I didn’t even know they made pita chips…but I can 96% guarantee I won’t buy another brand ever again. Oh.My.God. These taste like bbq fritos. I also dipped them in roasted red pepper hummus. I was a spicy pepper loving fool. When it was time for dinner I wasn’t THAT hungry…But i needed a little more than pita chips to keep me full til the morning so I grabbed a thin sliced chicken breast, a piece of corn and a side salad (spinach, tomatoes, avocado). 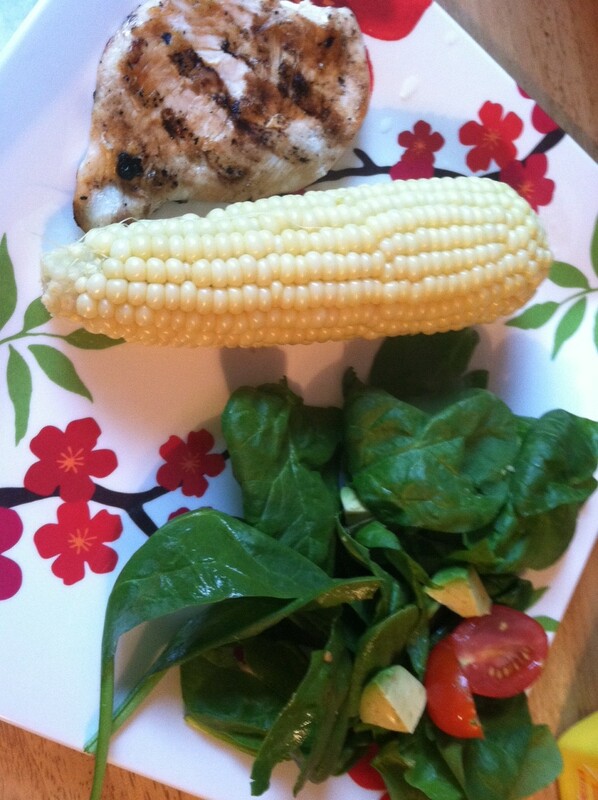 My meal screams summmmmmmmmmmmmmmer. Yes, it talks. Fruit is NOT a dessert…unless its served in something warm… with a dollop of ice cream. And that’s final. QUESTIONS: Do you consider fruit as dessert? 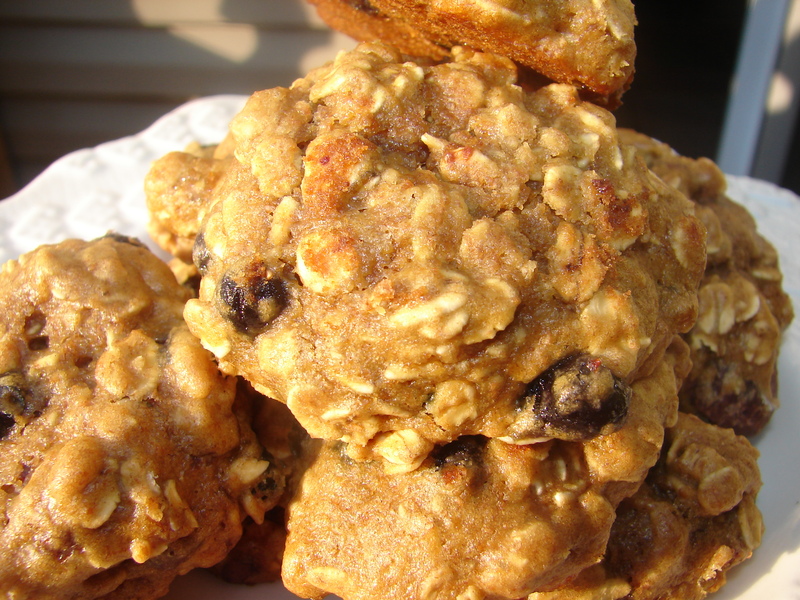 Can you think of another name for the Mini Vegan Oatmeal Blueberry and Carob Chip cookies?? Please and Thank you.